Pork loin roast is tender and juicy when made in your electric pressure cooker. 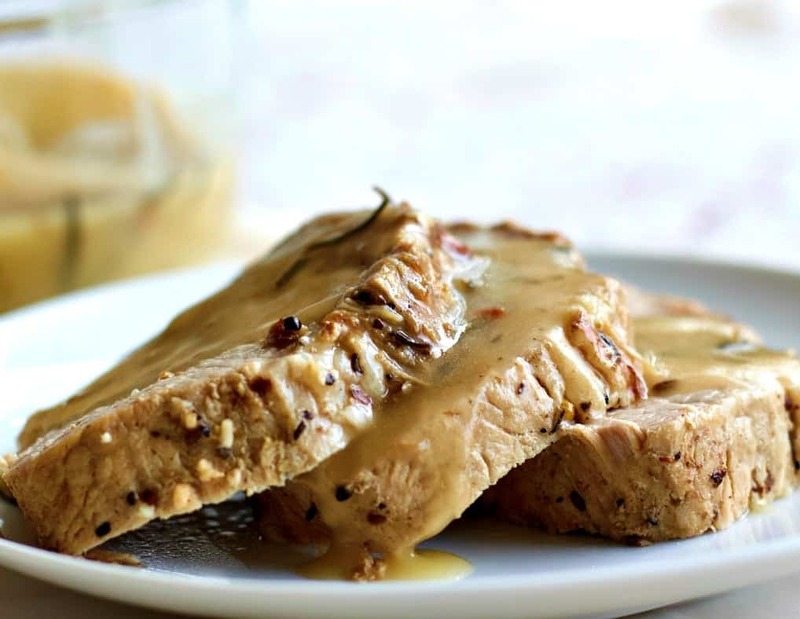 This boneless pork loin roast also includes a flavorful gravy recipe for the roast and sides. It’s all done in your instant pot in under an hour. This Instant pot pork roast recipe makes a wonderful weeknight dinner. It’s so easy to make and does not require watching. If you’ve had a busy day. Or if your dinner hour is way busy. Drag out your Instant pot and let it do it’s magic for you. Simply hit the saute button and brown the meat with your seasonings. Now add water and lock it down. Set it and forget it for 45 minutes. At the end bring out the meat to rest and whip up your gravy all in the instant pot. 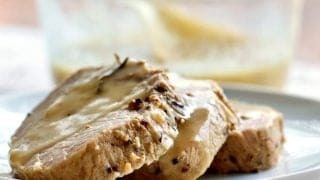 Serve the roast pork and gravy with a salad and a piece of really fine sourdough bread. A beauty of a meal. I sometimes add brown rice Quinoa blend as a side dish instead of the sourdough. Or make the traditional mashed potatoes. The gravy is so good with it. 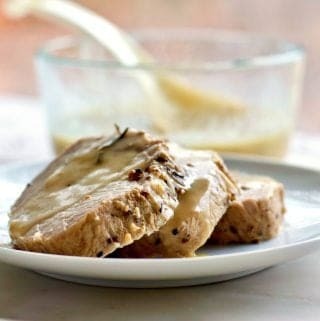 After making this boneless pork loin roast recipe with gravy twice I’m claiming a definite win. The meat is tender and juicy and full of flavor. And the gravy is a wonderful companion to it. Dave ate it till he was stuffed. Then he happily requested it for leftovers the next night. My ButcherBox monthly subscription box contained this gorgeous Pork Roast. Watch my butcher box review and unboxing on our YouTube channel to see what’s in the box.. I am so happy to have found a company I can trust to deliver high quality meat to my door. Even the packaging is sustainable. And they source from humane certified farms. Butcher Box Pork Loin Roast. For just us two this three pound roast is too much. Even with leftovers. Which we did have. So I cut off one end and re-froze it. Two weeks later I made this dinner again with the smaller piece (we still had leftovers). The great thing about making meat in the instant pot is the flavor. And the meat will be juicy if you follow the directions for your cut of meat. 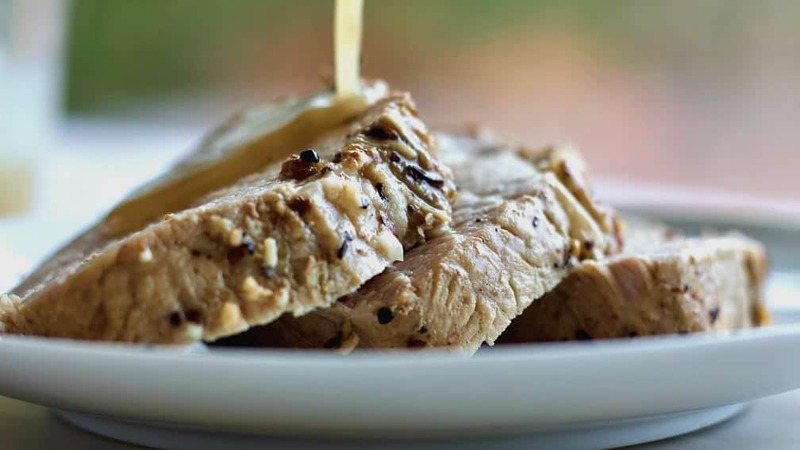 Instant pot pork loin recipe method is a bit different from the oven method you may be used to. Remember: When cooking under pressure the cooking time is determined by the THICKNESS of your meat. NOT the weight. If you slice up your pork roast into one inch slices and then put them in the instant pot Adjust the cooking time downward to 15 or 20 minutes. For example I cooked both of the pieces of this pork roast for the same amount of time for two different dinners. And they came out beautifully even though one was a pound heavier. Because the thickness of the meat was the same. EVEN IF THE ROAST WEIGHT IS HEAVIER. This is important to remember or you will wind up with all the juice on the outside of your meat. NOT on the inside where you want it. 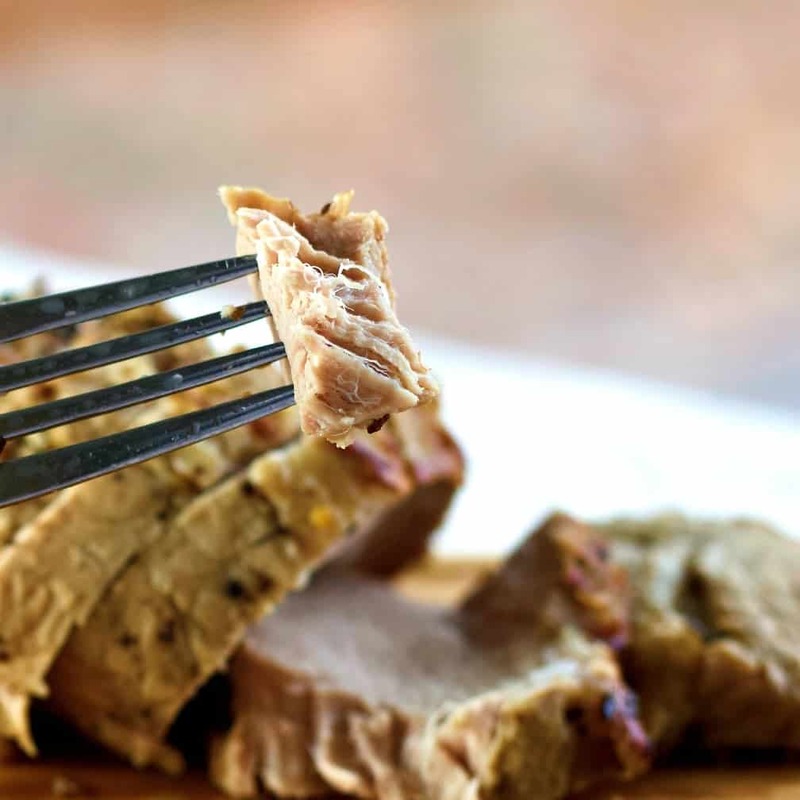 Pork Loin roast is so juicy and tender when correctly prepared in your instant pot. After you brown the meat in the oil and seasonings it’s all smelling wonderful. If you had to add water to deglaze the pan don’t be fooled! It may look a bit saucy in the pot bottom but! 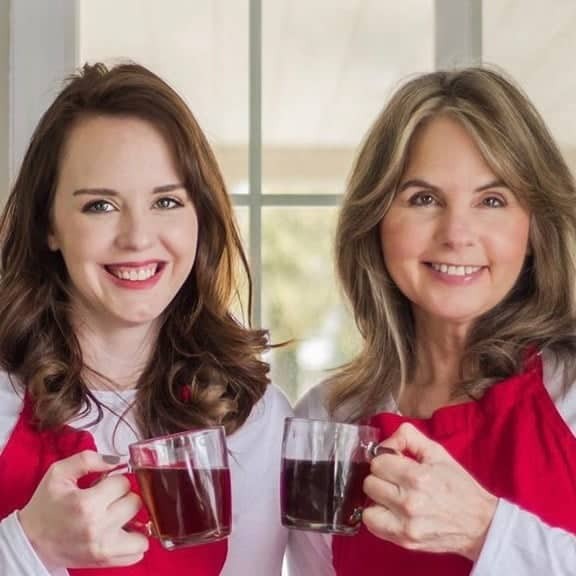 You still need to bring the water in the pot up to at least one cup or your pork roast may burn and the pot may not pressurize. Instant pots must have water of one cup or more in the bottom of the pot in order to correctly pressurize and cook. So no matter how much water you used to deglaze when browning the meat. Add more to get the required amount of one cup of water (or watery liquid). You won’t hurt the meat by adding a bit more water just don’t get ridiculous about it. When your instant pot dings let the pot natural release the pressure for 15 minutes. Then quick release. Remove the meat to a serving tray to rest. Now make your gravy. This gravy is made from the drippings left in the instant pot once the pork roast is finished and resting. The gravy is FULL of delicious flavor. Just like Grandma made from th dripping in the bottom of her roasting pan. The instant pot makes it really easy to make your own drippings gravy and it’s all done in one pot. You may make as much or as little gravy as you prefer for your family. Just add enough water to create the quantity of gravy you want. For example a quart of water will give you a little over a quart of gravy. I recommend you build the gravy amount you need to the side dishes you choose. The gravy amounts in the recipe card are for just the meat and a small side. If you make mashed potatoes or two gravy loving sides. Make more gravy. THEN You will need to also add in more flour and seasonings to thicken the extra volume of gravy and bring up the flavor a bit. Be SURE you allow the pot to boil on the saute function long enough to turn the gravy from opaque to transparent. Adjust it to your preferences and Salt and pepper to taste. Pork Roast with Gravy is moist and flavorful and so easy to make in one pot. Pork roast should be cooked to 145 degrees to be safe for human consumption. Check your roast temp with your meat thermometer before unloading it from your instant pot. If the temp is too low seal the pot and cook on manual high pressure for another five minutes. Then quick release and check the temperature again. Finally the FDIS recommends that you rest your pork for at least three minutes before serving for food safety. Resting up to 15 minutes is ideal. Resting your meat is beneficial for any grilled cooked or fried meat. Kayti says more about this in her pan fried chicken recipe. Rest the meat while the gravy is prepared. Enjoy your meal. Please rate this recipe and let us know in the comments below how this recipe goes for you. Pork loin roast is tender and juicy when made in your electric pressure cooker. This recipe also makes a flavorful gravy for the roast and side dishes. Set your instant pot to Sautè function. Add in the oil. Sprinkle 1/2 of the spices in the oil. Place the pork roast in the pot and brown on all sides. Deglaze with water as needed. Sprinkle the remaining seasonings over the browned pork roast. add remaining water to get the amount to at least 1 cup in the bottom of the pot. Set the instant pot to manual high pressure for 30 minutes. Natural release 10 minutes. Remove to plate and let rest. Set the instant pot to saute. Bring the drippings to a boil. Whisk the flour and 1.2 Cup of water together to form a rue. Pour the rue into the drippings through a sieve to remove lumps. Bring the pot to a boil and stir constantly until the drippings form a gravy. Remove from heat and serve with the roast. This gravy is made from the drippings left in the instant pot once the pork roast is finished and resting. You may make as much or as little gravy as you prefer for your family. Just add enough water to create the quantity of gravy you want. For example a quart of water will give you a little over a quart of gravy. You will need to also add in more flour and seasonings to thicken the extra volume of gravy and bring up the flavor a bit. Adjust it to your preferences. Remember: When cooking under pressure the cooking time is determined by the THICKNESS of your meat. NOT the weight. I cooked two pieces of pork roast for the same length of time that were a whole pound different in weight. BUT if you are cooking a small thin piece of roast or if you cut your roast into smaller slices before cooking. Adjust the cooking time downward to 15 to 20 minutes.